Continuing the previous post on snapshots, today I'll discuss some things that I'm doing with them every week. Here is my snapshot list for this past weekend. As you can see, there is a snapshot for every major event of the service. I’ll walk you through the snapshots for an example of what’s happening (and changing). You’ll notice that the numbering of the snapshots is a bit inconsistent. That’s because between the Saturday night and Sunday morning services, we moved a few things around. All I had to do was move the snapshots. There is a Renumber function, but I forgot to do that. We also changed who was doing the prayer after the worship set, so I did have to update that on the fly for the 9 AM. One feature I really like about the DIGiCo snapshot system is that if you grab a fader in the middle of a snapshot playback, it instantly pulls it out of the snapshot so you can control it manually. My original snapshot had Adam doing the prayer, but Sunday it was Ryan. When I fired the snapshot, I held Adam’s fader down just long enough to pull it out of the snapshot, then moved Ryan’s up. Once I had it reconfigured, I re-saved the snapshot for the 11 AM. As you can tell by all the red X’s, I’m not recalling that much. I’ve expanded the Group Outputs section so you can see that while I’m not recalling most of the groups, I am recalling the fader position of my Vocal Smash group. This is basically a bus with a comp on it that I use to thicken up our worship leader’s vocals. Some songs need more smash, others need less, so I recall it in the snapshots. The green check mark on the fader column for the Input Channels indicates that I’m recalling fader position for all the input channels. 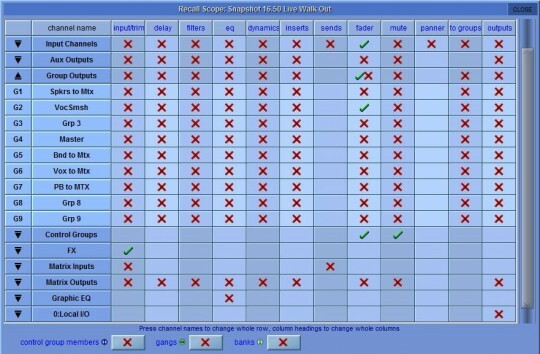 This page gives you an idea of how granular the control is for each snapshot. If I had to change this for every snapshot, it would be a huge pain; thankfully, I set this up on the first snapshot and it carries through every subsequent snapshot that I create, unless I tell it otherwise. Another cool function is the cross fade time page. For every snapshot, it’s possible to control how long a change takes for every parameter change. Maybe a visual would help. I’ve expanded the Input Channels section so you can see that while I have most channels set to change over 1 second, my iTunes fade is 4 seconds. This is the walk out, so I want the music to fade up a little more slowly. My second snapshot of a service will have an 8 second fade on the iTunes channel to fade it down smoothly at the beginning of the service. 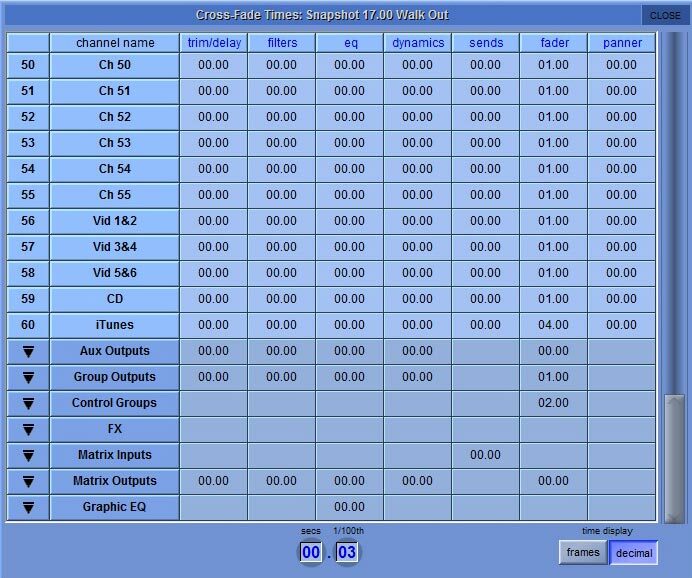 Again, each parameter of each channel, group, bus, or EQ can be set to change rates at different times for each snapshot! Again, that’s a lot to edit, and thankfully, there is a quick way to do it. The SD-series has an Edit Range button which enables me to edit multiple snapshots at once. On a normal week, I create all my snapshots to do what I want them to do. When I’m all done, I hit Edit Range, select all my snapshots and set the fader times to 1.00 seconds. After confirming the change, I go back and edit the iTunes fade times for walk in and walk out. All told, it takes less than a minute to set it up. Before the service, I’ll take a minute or two and punch through my snapshot list. I want to make sure things like speaking mics come up when they should, and that nothing is going rouge. 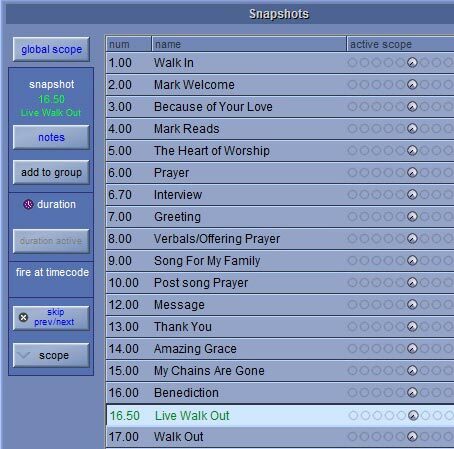 I’ve learned the hard way this is a vital step to a solid snapshot workflow, especially when you go back after a rehearsal and insert snaps for prayers and announcements. Sometimes you make the change and it doesn’t save the way you think it did. Taking a minute to check makes for a smooth service. Once that’s done, mixing gets really fun. The boring stuff is taken care of and you can focus on the fun stuff—making the music sound great.